A Lakota elder summons a white writer to visit him and help him write a book about his people. A part of the Beyond the Frame Project: To Be Native. View the trailer here. Directed and produced by Steven Lewis Simpson, director of Rez Bomb, A Thunder-Being Nation and numerous other films. @ The Barnyard Cinema, $12/adults, $10/students. 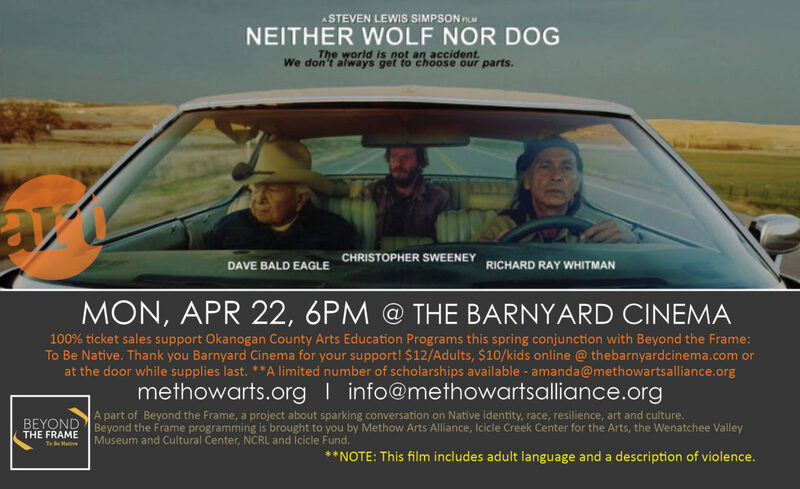 100% of proceeds from admission benefit Arts Education Programs in Okanogan County in conjunction with the Beyond the Frame Project: To Be Native. The project sparks conversations on Native identity, race and resilience, art and culture. Scholarships available @ amanda@methowartsalliance.org. **NOTE: This film includes adult language and a description of violence. Viewer discretion advised. An adaptation of this 1996 Minnesota Book Award winner, Kent Nerburn draws the reader deep into the world of an Indian elder known only as Dan. It’s a world of Indian towns, white roadside cafes, and abandoned roads that swirl with the memories of the Ghost Dance and Sitting Bull. Readers meet vivid characters like Jumbo, a 400-pound mechanic, and Annie, an 80-year-old Lakota woman living in a log cabin. Threading through the book is the story of two men struggling to find a common voice. Neither Wolf nor Dog takes readers to the heart of the Native American experience. As the story unfolds, Dan speaks eloquently on the difference between land and property, the power of silence, and the selling of sacred ceremonies. DATE: Mon, Apr 22, 6pm. TICKETS: $12/adults, $10/students. **NOTE: This film includes adult language and a description of violence. Viewer discretion advised. LOCATION: Barnyard Cinema in Winthrop, WA. INFO: amanda@methowartsalliance.org, 509-997-4004. A part of the Beyond the Frame Project. Beyond the Frame is a community-wide initiative revisiting the photographs of Edward S. Curtis and sparking conversations on Native identity, race and resilience, art and culture.